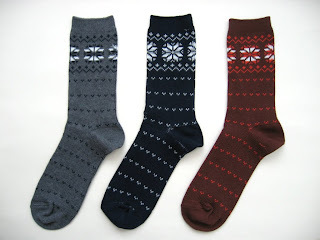 ...these Fair Isle socks from Uniqlo. I was bitterly disappointed when I realised I'd missed out on the knee-length version (sooo cute) of this style, but gladly snapped these up instead. They'll be the perfect accompliment for my new shorter Uggs. Sweet, aren't they? Made of extra-fine cotton, they're satisfying thick and just £6.99 for a pack of three. Bargainous. Those are soooo cute Angela - I love them! I bought some really good socks in Bergamo in Italy and they were made in Italy! They came in lots of jewel colours and were 5 pairs for 10 euros. I liked them so much I have bought lots as Christmas presents.